There is a legend of a tamer who developed a truly golden bond with his Monster. It is said that one fateful day he crossed paths with a very old, very powerful Scavengeist. The Tamer soon found himself cursed, turning all he touched into precious gold. Realizing his bleak future, his Monster companion embraced him willingly, turning both into a statue of solid gold. 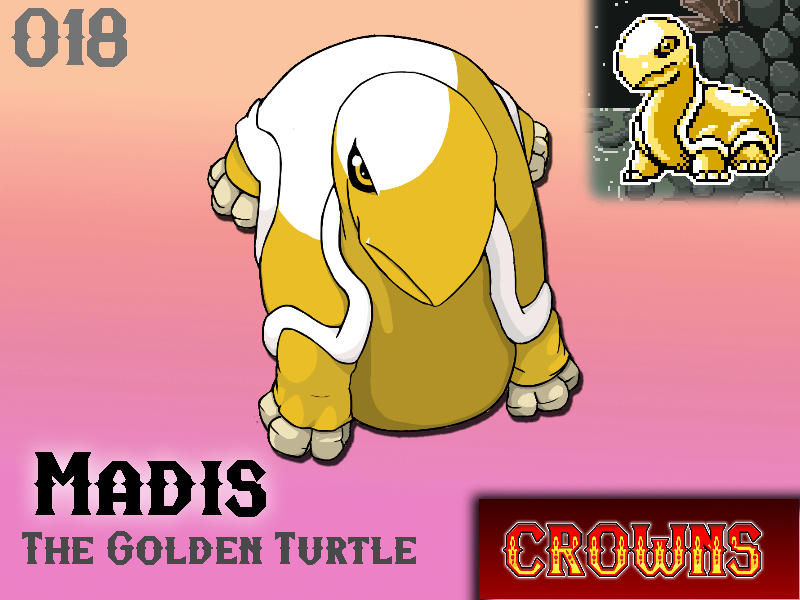 This legend is said to explain the birth of Madis, the golden turtle. Before the revolution, Madis were held as trophies, only by the Kings. These golden creatures were symbols of royalty and were forbidden from ever falling into human hands. After the rebellion, the new rulers commissioned several Monster Breeders to distribute Madis eggs to any young tamer showing promise, a symbolic gesture by the rulers to demonstrate their promise to the people - an investment in a strong future for their country. Madis represents the heights of respect that can exist between a Tamer and their Monster when proper training is practiced. Today, small breeding populations have even been reported in the wild. Will Madis make your team?